Write Naked is a writing life cut open. This site launched in 2011 and is maintained by Tara Lynne Groth, a freelance writer in the Raleigh, North Carolina area. She lives in a small town with the love of her life. When she’s not writing, you can find her chasing their backyard chickens or tending to her bees. She loves food, Paris, National Parks, and barre. The ballet one, not the beer kind. 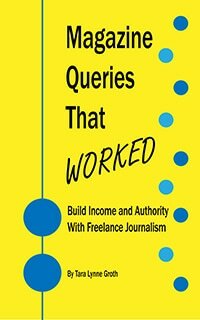 She is the author of Magazine Queries That Worked: Build Income and Authority With Freelance Journalism (June 2017). Here you will find occasional vignettes from the freelance writing life, behind-the-pen scoop on articles, tips for working with editors, overviews of conferences, interviews with publishers, guest bloggers in the publishing industry, and a few miscellaneous blogs on travel and motorcycles with a writerly twist. Read more about her writing awards.